When digital assets entered the financial scene in 2016, many people were wary of the new innovation which, at that time, was downright unpopular. However, after studying the technology behind digital assets, I decided to invest in them and follow their progress. My decision to do so was largely informed by a desire to see capital formation being decentralized. This is because, in the period leading to the assent of the Jumpstart Our Business Startups (JOBS) Act, I was part of the movement that lobbied for the approval of the bill in the US Congress. The support for the bill was overwhelming, more companies supported it compared to those that didn't. The Wall Street Journal reported that only 15 companies were against the bill, compared to 48 that supported it. Finally, the JOBS Act was enacted into law upon signing by then President Obama in April 2012. For people who lobbied for the JOBS Act like myself, this piece of legislation was a game-changer for various reasons. One, it facilitates disclosure and accounting of new or small companies and allows them to raise capital faster through crowdfunding. Those who gave their support to the JOBS Act say it encourages the creation of jobs. Secondly, this piece of legislation paved the way for non-accredited investors to own a stake in startups, a privilege that was accorded only to accredited investors under US Securities 1933/34 law. It is the provisions under Title III and IV of the JOBS Act that laid the groundwork for the wave of initial coin offerings that we are witnessing now. While under Title III startups are allowed to issue equity to investors and raise a maximum of $1 million over a year, Title IV paved the way for startups to crowdfund up to $50 million in what has been termed as 'mini-IPOs'. The crowdfunding approach found its way to the cryptocurrency world in 2013, ushering in a new way of raising capital specifically for crypto-related projects. This led to the birth of the concept that we now refer to us initial coin offerings (ICOs). In this concept, companies create new cryptocurrency ventures then invite investors to purchase units of that venture in the form of digital tokens. The first ICO was launched in 2013 by Ripple. At that time, Ripple Labs began creating a payment system and developed 100 billion tokens that it sold to finance the creation of the Ripple platform. In mid-2014, another venture, Ethereum, launched what became the most prominent ICO. Following the success registered by these two ICOs, the cryptocurrency movement has attracted many investors, both accredited and non-accredited. Having supported the democratization of finance since 2011, I am a strong believer of fintech technologies. This year alone, I have been interviewed by Bloomberg, CNBC, and Fox News about cryptocurrencies, ICOs, and the need for regulation. However, I have always emphasized that participation in ICOs must be based on informed decisions. Am very vocal in my advice to an average of 50 active ICO firms that I support at any given time, now nearing 200 firms in total. Often my role is to guide them on how to run their crowdsourcing campaign. Following the exponential growth of blockchain technology and ICOs, my Family Office LDJ Capital, stepped into the ICO space to provide advisory services in mid-2017. We did this because we realized an urgent need to support ICO teams to get the right answers to their questions, particularly when they are not sure whether those questions are correct. As is the nature of ICOs, the teams have to showcase their ideas and brand over a very short time, with sale schedules running for a maximum of 9 months. To help with this, we chose to provide more support to the ICOs I advise beyond the ordinary advisory services. This is how the ICO Advisory Program we run through The Soho Loft Media Group, a subsidiary of LDJ Capital, was born. The sole purpose of the advisory program is to give ICO companies a head start by guiding and supporting them in their media and marketing strategies, as well as public and investor relations. We have put together a 25-member ICO management team to support this program. The team features Managing Directors, Client Relations Managers, Events Manager, Content Manager, Social Media Manager, and Admin Manager. It also features several Tech and Media Support, and Editorial Staff. 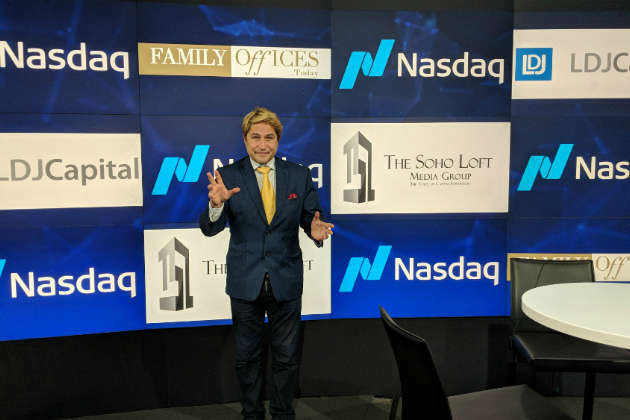 The Soho Loft Media Group, which reaches millions of people through its content and distribution, provides advertising services to complement the personal time I spend advising ICOs. As such, we are adding services to ICOs on a weekly basis and at no additional cost to augment ICO marketing efforts. Its similar to an incubator with an end-to-end full service, a 360-degree agency which includes development partners who can do an end-to-end fulfillment of any ICO concept. This is precisely why LDJ Capital established the $200 million LDJ Cayman Fund Ltd. The Fund is designed to provide financing to some of the best ICOs we can find. We deployed short of $10 million to some of the best companies across the globe and we are still looking for worthwhile ICO projects to support. The Soho Loft Media Group has established a 50+ step process for onboarding ICO companies or projects. Every best-in-class ICO has to go through these steps, after all, Wall Street, institutional investors, and the family offices we deal with demand proper governance and high accountability from ICOs. 2017 was the year of cryptocurrency revolution and it is not abating this year. According to CoinDesk, the total amount raised by about 340 ICOs was $5.33 billion in 2017. However, this amount was exceeded in the first quarter of 2018 when an estimated 200 ICOs raised $6.3 billion. With Wall Street companies such as Goldman Sachs now showing interest in cryptocurrencies, we are likely to see an increased flow of institutional capital into this space. This could double, triple, or even quadruple the amount raised via ICOs in the coming months.